San Bernardino, Calif.'s Omnitrans introduced 15 new buses, manufactured by New Flyer of America Inc., which will replace three 35-foot 2003 model year coaches and 12 40-foot model year 2001 and 2001 coaches. All are powered by compressed natural gas. 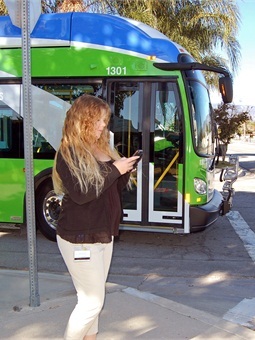 With pedestrians often texting, listening to music or watching the latest cat video on their phone instead of paying attention to surrounding traffic, Omnitrans is making an extra effort to get their attention by incorporating audible turn signals on the new buses going into service this month. The caution announcement, given in English and Spanish, is triggered automatically when the driver turns the steering wheel. Omnitrans will evaluate the effectiveness of the new safety feature before considering a retrofit of the rest of its 177 bus fleet. In response to customer requests, the new buses are also equipped with front-mounted bicycle racks that hold three bikes at a time. This brings the number of 40-foot buses with triple bicycle racks up to 37, while the remaining buses have racks that hold two bicycles. After getting positive marks for new generation wheelchair securement devices used on the agency’s sbX bus rapid transit line, Omnitrans will phase them into the rest of the fleet. New buses have one rear-facing securement and one forward-facing securement. The rear-facing system gives passengers with wheelchairs more independence. They can back their mobility device into the area, pull the arm down and set the brake, without assistance from the operator. This also helps reduce dwell time at bus stops. The new-style forward facing wheelchair securement allows the coach operator to more easily secure mobility devices with minimal reaching and bending. Passengers then click together a lap belt to secure themselves to the mobility device. 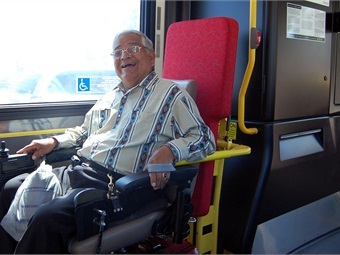 Omnitrans buses transport about 120,000 customers with wheelchairs each year. Positive customer feedback on the rear-facing wheelchair option on sbX vehicles, led Omnitrans to buy them for new 40-foot buses.